NY: Random House, 1956. Bound in gray cloth and black boards, stamped in black and gold, in a stunning red, white and blue dust jacket. A beautiful copy of this book and tipped in (to the front endpaper) is a TLS by J. Edgar Hoover on FBI letterhead. It would be difficult to find a nicer copy and with the signed letter to boot. 368 pp. . Typed Letter Signed. Third Printing. Hard Cover. Near Fine/Near Fine. NY: George Doran, 1925. 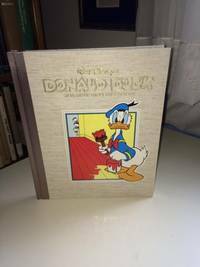 A fine copy in 1/4 vellum like spine and blue boards in original slipcase that shows edgewear. With seven (7) tipped in color plates with tissue guards. This copy was limited to 105 copies of which this is #52. An added bonus -- laid in is a 6" by 9" trimmed early photo of Ms. Bianco and a (TLS) Typed Letter Signed by Ms. Bianco; also a folded handwritten "note" to a couple in Bucks County from 1943 about visiting and what time her train gets into Easton, PA. So, besides the book, a couple of signed notes, letters by the author. Margery is the author of the noted children's classic, "The Velveteen Rabbit". . Signed by Author. First Edition. Hard Cover. Near Fine/No Jacket. Illus. by Arthur Rackham. 4to - over 9¾" - 12" tall. Signed, Limited. Salzburg: Poetry Salzburg, 2006. 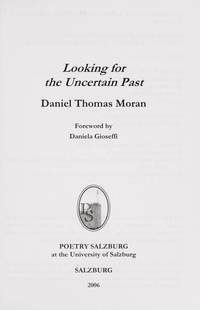 Trade paperback; author signed letter laid-in; foreword by Daniela Gioseffi; 112pp.. Author-Signed Letter Laid in. First Edition. Soft Cover. Near Fine/No Jacket. 1953. An Autograph Letter Signed (ALS) by Archie Moore (on his letterhead stationery) in the original mailing envelope which is also in Moore's hand. Three folds, but the letter is in great condition and the content is touching. 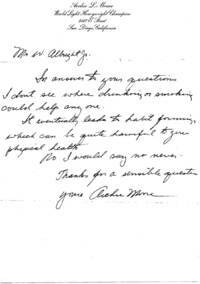 It is written to a young lad who wrote to Mr. Moore re: Drinking and Smoking. Moore was the World Light Heavyweight Champion from 1952-1960. THe fighter had 220 professional bouts with a record of 136 KOs. He is the only boxer to have fought both Rocky Marciano (1955) and Muhammad Ali (1962), losing to both.. Inscribed and Signed By Author. Near Fine/No Jacket. Signed Letter. London: Collins, 1985. First edition signed and inscribed by the author on the title page, and includes a typed, signed letter laid-in; usual browning of edges; 256pp.. Inscribed and Signed By Author. First Edition. Hard Cover. VG++/VG++. Berkeley, CA, 1969. One full page on University of California, Berkeley stationery. Dated May 28,1969. Written to Ray Roberts of Macmillan Co. to thank him for a beautiful printing job on his book, The History of Polish Literature and requesting that the publisher send copies of the book to two reviewers (one in Switzerland and one in France). Milosz is a Nobel Laureate who passed away in August, 2004. Letter is Near Fine with no folds and a few small chips on one side.. Signed . 8 1/2" X 11". Typed Letter Signed "Westbrook Pegler"
NY, 1942. One Page on Pegler's Scripps-Howard Stationery. Dated August 24th, 1942. Written to fellow author J. C. Furnas. "I am greatly cheered by your note about my little account of a busy day's activities. You must come over sometime when we are having an interesting discussion with some young people and join us at squat tag". Sincerely, Westbrook Pegler. Some minor tears to top edge, folded twice, a few tiny age marks. Text is bright and clean. Pegler was an American Journalist -- Chicago Tribune, NY World Telegram -- (1894-1969). . Signed . 8 1/2" X 11". 1956. An Autograph Letter Signed (ALS) by Charles McCormick head of the McCormick Spice Co. on Cunard Line stationery in 1956 (folded once). Included with the letter is a signed calling card (signed, too) inviting the recipient to "cocktails" in the McCormick cabin. . Inscribed and Signed By Author. Near Fine/No Jacket. Signed Letter. NY, 1942. Two full pages on Pegler's Scripps-Howard Stationery. Dated May 23, 1944. Written to fellow author J. C. Furnas. Lengthy (six paragraph) typed letter re: Rehabilitation of an old farm and the problems, joys of having a farm and raising pigs and sheep. He ends by talking about Hitler and the War and Fascism/Communism. Interesting commentary. Some minor tears to top edge, folded twice. Text is bright and clean. Westbrook was an American Journalist -- Chicago Tribune, NY World Telegram -- (1894-1969). . Signed . 8 1/2" X 11".